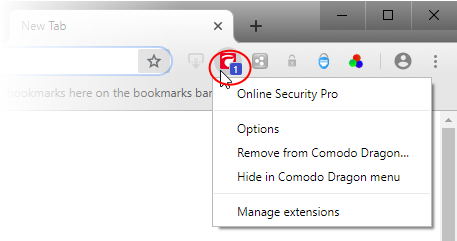 Comodo Online Security (COS) is a website filtering extension that protects you from harmful websites, malware, hackers and more. 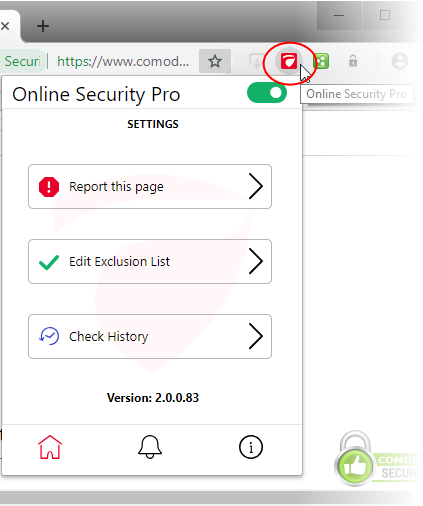 Report this page	- Submit the URL of the site you currently visiting to Comodo. Comodo will assess the site to see if it poses a danger to the public. If so, it will be added to our global blacklist. Edit Exclusion List - Exclusions are those pages you do not want COS to block, even though they are blacklisted. This link allows you to modify the list of exclusions. Version number - Version details. Product page - The webpage contains general information about the product and lets you download the extension for other browsers at https://antivirus.comodo.com/online-security.php. Release page – Contains the test release notes where you can find out about new features and bug fixes.